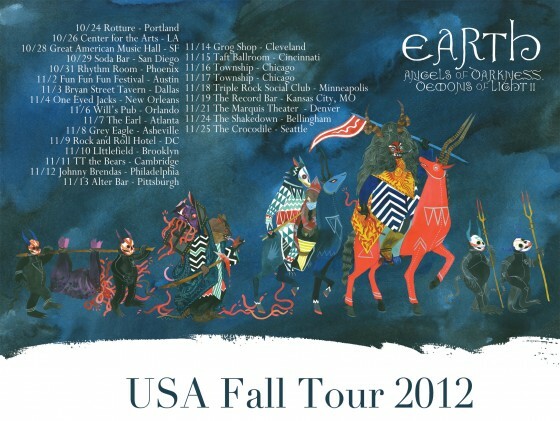 Following bursts of worldwide touring in support of their two-part Angels of Darkness, Demons of Light album series, Seattle’s EARTH will embark on their newest tour this week, with a nearly month of live performances confirmed across America. The most extensive American tour EARTH have planned since their 1990 inception, the Seattle purveyors of the slow-motion riff will traverse the country and back on a twenty-five date run, kicking off this Wednesday, October 24th in Portland, Oregon. Along the way the quartet will take part in the massive annual Fun Fun Fun Fest in Austin, Texas alongside literally dozens of international artists of all genres. This will be the first U.S. tour since they hit the road in support of Angels of Darkness, Demons of Light I in 2011, the band’s set for the tour confirmed to contain a majority of the material from Angels of Darkness, Demons of Light II. 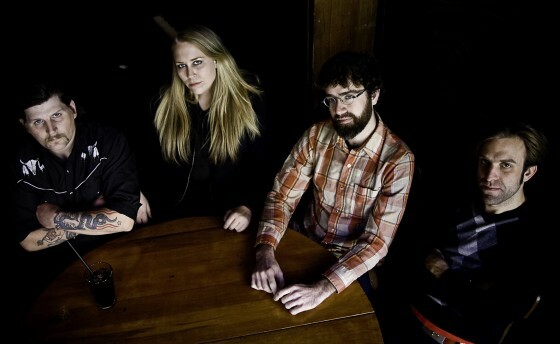 While the band is touring in support of the Angels of Darkness, Demons of Light albums, the EARTH lineup for this voyage will be the touring lineup from the band’s lauded 2008 LP The Bees Made Honey in the Lion’s Skull, comprised of Steve Moore on keys and trombone, Don McGreevy on bass, Adrienne Davies on drums and founder Dylan Carlson on guitar. Support will be provided by Stebmo (featuring members of Earth and more) as well as Southern Lord labelmates Eagle Twin and Fontanelle throughout the journey. Angels of Darkness, Demons of Light II can still be streamed its entirety VIA PITCHFORK.